This is the 1998 Robocop video game, first out of many. It was licenced out to two separate teams, Data East and Nihon Bussan, by Ocean who had acquired rights to video game adaptations a few years before the movie even came out. It's got your typical arcade platformer pumped-up action gameplay that lets you do all the things Robocop likes to do. The coolest part about the game is the way everything freezes during the animation of Robocop pulling out his gun. 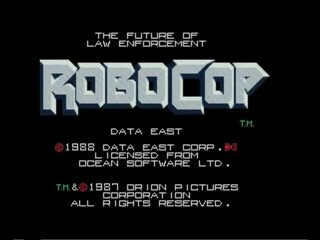 Most people familiar with Robocop's gaming iterations usually think of the infamous NES game. While this version is by no means perfect, it's one of the better handlings of the license and one of my personal favorite arcade games, so there wasn't much doubt what I was going to run first once I had an arcade setup. This run was performed using default settings (Normal difficulty, high starting health, full health recovery from bonus stages). *Robo moves faster jumping than walking. *Robo and enemies/objects do not have any invulnerability frames. Not such a good thing when you have a stream of bullets coming right at you. *When punching enemies/doors (done automatically when Robo is close enough to a target), there's a kind of "punch cancel" you can do. Normally, a target will only take one hit per punch animation (Robo punching twice). If you attack coming down from a jump with the right timing, you cancel that animation and can start a second one right upon landing. This helps out especially with busting through doors quickly in a couple parts of the run. *Cobra Cannon, which drops in stages 3 through 6, is quite the thing. It'll one-shot any normal enemy and bosses in 1-2 shots. I use it extensively for clearing out mobs, especially in later stages where the game can potentially spawn enough sprites to induce slowdown. The jump-punches at the start are important for clearing space early. When the motorcycle appears, I duck under his oncoming jump and then time a jump forward to catch a damage boost from him. I then need to do another jump forward right away to bypass the trigger just before the window gunners, as all action freezes from that point until I finish drawing my gun. Overall this was a decent stage. The kill on ED-209 could have gone a bit faster and ideally I'd have more life left at the end. I need to pause after the initial jump to free the hostage, both for the health recovery and setting my position for the next couple jumps forward. I need to time my punches on the doorway so I can hit the chainsaw guy twice before he nails me again a second time. After the halfway mark, I need to take my time so I don't get sniped by the window gunners, then take them and other incoming enemies out as efficiently as possible. The truck boss right went essentially perfect. I want to position myself in front of the reel wheel so I'm close enough to point-blank the chainsaw guys with the 3-way shot. I need to get a perfect on both bonus stages for the max health increase & refill. You're only penalized in the bonus stages if you allow a target to de-spawn. I want to jump right after punching the drum & weapon box to clear the press. This level also introduces the Cobra Cannon, my best friend. I had some decent luck with this stage, though I took more damage than I would have liked. For the bosses, the left crane's hitbox doesn't spawn until its vice is fully on-screen, so I take out the right one immediately while I'm waiting. At the start, I need to be careful not to scroll the screen too far to the right. That makes sure I don't despawn Cobra Cannon guy and that only the first two turrets fire. This stage and the one that follows represents how much Cobra Cannon helps with lag control. Ideally I should have had an extra shot at the end for the last pack of jetpack guards, but I'm able to make it through without too much damage. Also a rare instance in this game of killing the boss before it even appears on-screen. Getting the punch-cancel on the first door is key. Otherwise I have to wait for the spikes to go down to nail Cobra Cannon guy and depending on how he decides to move can waste a lot of time. Essentially I want to get through each floor as soon as possible so that I don't take too much turret fire, but also have to time jumps right to avoid the floor robots. Punch-cancel timing was off with the 3rd floor door but that's the only real stumble with this stage. A decent run through this stage should leave me at ~70% health. As with stage 6, I'm trying to strike a balance here between regular progression and not taking too much damage before I reach the full health refill at the midway point. I do encounter some slowdown with the enemies on the 4th floor but even with that this is the fastest route I've found yet through the stage. During the long elevator climb I want to burn off laser shots to keep the enemy count down, but also because I don't want too many for the final boss (no more than 11-12 going in). The final ED-209 fight went just about as expected. One thing that may not be too obvious is that the laser shot deals additional damage to ED when he's stepping backwards, which is why I hold back on firing the last shot until he's heading towards the right edge of the screen. I'm pleased overall with this run despite its hiccups. If stage 4 had gone better and with some better luck, this would have likely been a 9:05-9:06. At some point I would like to improve this run. I believe sub-9 is doable with better damage control (to minimize health refill time in bonus stages) and more optimal strats. I'd like to give thanks to everyone that watched my attempts on stream, and to the other arcade runners in SDA (MURPHAGATOR!, PJ, Butters, if there's anyone I missed I apologize!) for inspiring me to tackle a run of my own.